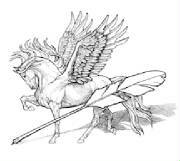 "Pegasus Writers Stable is an on-line organization of Professional Freelance Writers of Non-Fiction." We visualize a network of members world-wide. Try to imagine our organization as a "writers cooperative association." Through the use of chat lines, bulletin boards, and secure members-only exchanges we may be able to establish or maintain our place in the 21st century's electronic age. 1. Seeking assignments for our members. 2. Sharing useful information with our fellow writers. 3. Establishing credibility in the publishing world as the main source for dependable writers. One way of ensuring our members' professionalism is by requesting three clips of previously published articles. (For pay). Another way will be through our Mini-Bios listing, which is found under "List Of Members." Their credentials become obvious when one views their publication credits, and other backgrounds. We feel that publishers and other clients cannot go wrong when including our fine "stable" of professionals among their favorite freelance writers. Among ourselves, we feel we're in "good company" thus far, and we welcome like-minded writers into our "Herd" of seasoned professionals-- Perhaps You?